1stGen.org • View topic - The Small Block Binder build project. 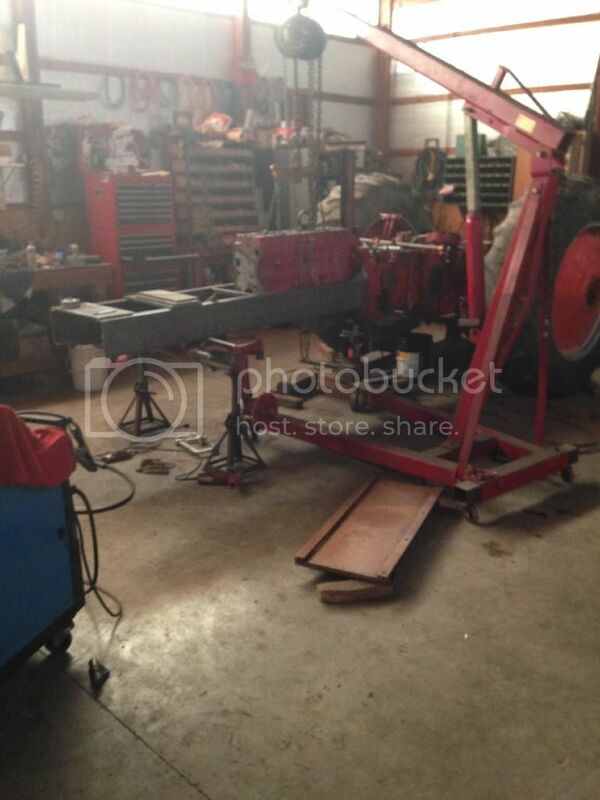 The Small Block Binder build project. 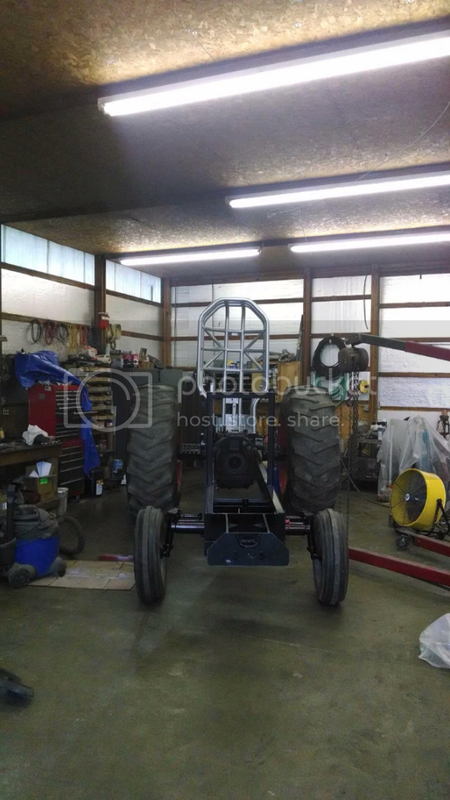 Just going to go ahead and change this to my tractor build thread. Any questions just ask, I will answer as best as I can. I'm pretty new to tractor pulling. Been around it all my life just never built one. I'm wanting to build a 3000 rpm turbo tractor to pull in the 9500/10500 class. Is an IH 706/806 a good platform to start with? Is the rear end gearing good enough or should I go a different route? I'm wanting to build a DT466 to power the tractor. I have heard some blocks are better, ie roller motor. What's the best block to start with? Will this engine already be p pumped? What turbo should I expect to buy or at least a rough idea? I have also been told that I can mix crank, rod, and pistons to get more ci; which ones? Where should Is the best place to look for trans parts? Thanks for any help and I'm sure I will have more questions. Last edited by diesel freak01 on Sun Jan 18, 2015 9:28 pm, edited 1 time in total. Re: Anybody with some good IH pulling advice? I've never built one either but I know enough to get me in trouble. Is this "farmstock"? If so, there may be rules against the P7100. There's a lot of turbo rules too. such as 3x3, 3x3.5, etc. I see tons of 1066s around here, maybe as many as 40% of tractors. I don't know if there's an advantage there of if it's just what everyone had back in the day. To sum it up, pick a class and organization that you're going to pull with and build it to suit their rules. For competition, 1066 or 1466. To go a little farther in to detail, we are starting with a 706/806 frame and rearend. We will be dropping a DT466 into it and doing some other mods to the engine. The turbo rules are 3x3 and the engine came factory with a P7100. 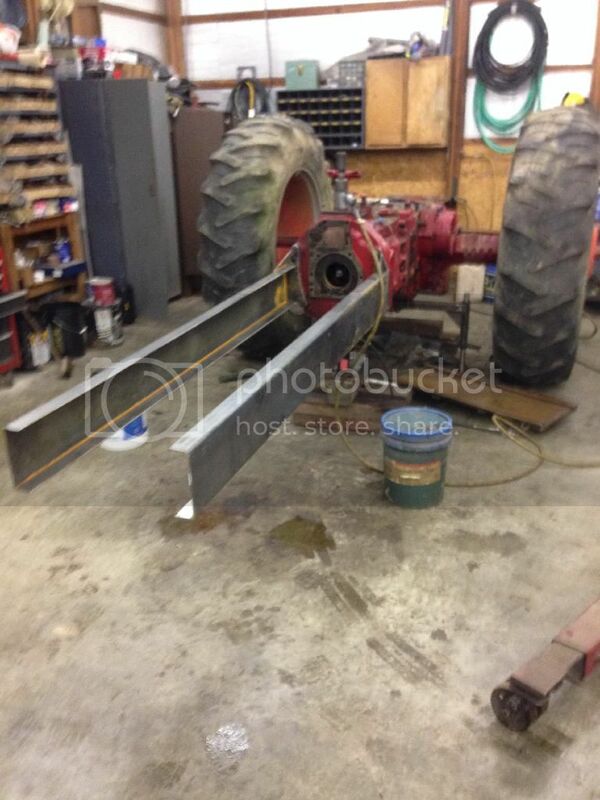 We will then be putting either 1066 or 1086 sheet metal on the tractor. The reason you see so many 1066 is thats the most cost effective starting point for a real pulling tractor. Green junk is too expensive to build. Rules: All General Rules and Safety Rules apply to the Turbo Class unless otherwise specified in the following rules. Engine: Engine, not to exeed 585 ci, must be of same manufacture as tractor with the same number of cylinders (i.e. an International tractor must have an International engine). Engine must bolt in manufacturer’s intended location. Intercooler: Only factory equipped intercoolers using engine coolant allowed. Engine RPM: Engine is not to exceed 3000 RPM while pulling. Tractor must have an ISSpro #01R8906 magnetic pick-up with 14-16 gauge 110v wire attached to 3 prong female plug accessible to the sled. Wire must be one continuous wire outside of frame rails and be visible with no splices. Injector Pump: Any pump up to and including a Bosch P-Pump. Maximum tire sizes: 20.8 x 38 any cut tires allowed. Hitch Opening: Hitch opening size requirements 3 ¾ inch front to back and 3 inch side to side. The next size larger is a DT530 and the difference is cranks. So stroking a 466 results in a 530. With different sleeves, pistons, etc, you can get close to your cube limit. Turbos: Columbus is a big name. Hypermax is a big name. Scheid is a big name. All carry big prices I'd bet. I do wonder where Fleece would come into play. I don't know if they even would touch tractor stuff. From what I gather the P pump came on the early 90's engines. After some research i think i want to stick to a 92-94 DT466. With the 466 and some different internals we can make it to the class rules very easily. Now my problem is finding a base tractor to start with. 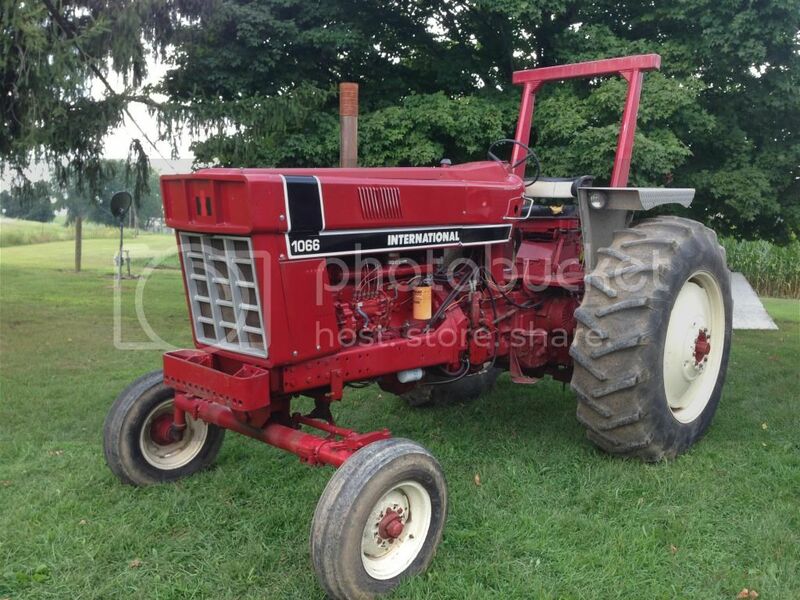 Anybody have any leads on a 786, 886, 986 tractor for cheap? No motor, cab, 3 point, pto would be a big plus as we have to remove them anyways. Well I got a tractor sunday. 856 rearend, DT466 engine (pump upgrade, injector upgrade, turbo upgrade done), 1066 front frame and sheet metal. Now comes the fun part of blowing it apart this winter and blowing a ton of money! Picked up a set of cut 20.8 tires a few weeks ago. Waiting to pickup a p-pumped DT466 engine and going to send it in to have the block decked, head shaved, counterbores redone, and have the sleeves cut for fire rings. Then send the pump and injectors thats in the tractor to be tested. Also sending the p-pump in to have it built. Should be an expensive and long winter! What class is that? is that the new "pro farm" class that they are having around here? Looks like it would be a lot of fun to build one for that class. If you ever make it to a pull around the canton area look me up. there ususally isn't a pull within 60 miles of me that I don't go to or pull at.. but most times I won't be pulling the same night as you, being an antique class and all. 1990 W350 4X4 NOW INTERCOOLED 5-speed. Boost/Pyro. Few light tweaks to the pump. Now a dually with an aluminum flatbed!! Sorry to take so long Farmboy, it didnt show up until today. We will be pulling with the American Farm Pullers out of Mason WV. Its what they call a Pro Farm turbo class. 3000 RPM p pump, 3x3 turbo, any cut tires, water injection allowed. Should be a blast. Little update. We have decided to run the 466 with a little upgrading done to it this year. Have the head cleaned up and valves redone just little stuff right now. Spending the money on the drive train and a fuel pump. Picked up a roll cage and aluminum fenders saturday. Picked up a tractor front cover sunday. Picked up a Precision 3x3 Pro farm turbo a while ago along with an Atlas 3 disc clutch. its coming along well. Started tearing it apart over the weekend. Having a new frame built as i type from a local machine shop. Im keeping a pic diary that i plan to upload here as it goes. Anybody know of a good P pump shop that isnt outrageously Priced. Columbus Diesel wants $5300 to build our pump. Definitely keep us up to date. Hypermax, Hart's, and Scheid. They won't deviate much from the $5000 mark. We'll a little more work done on the tractor. Got it split and the engine apart. Had frame rails made. Bought a used injection pump. Got a roll cage. Made a deal for a transmission just have to go pull it from the tractor it's in. Got some other misc stuff. Well thought I should give everyone a little update. After a long winter we are now starting to go back together with the tractor. Ill include the photobucket link so you can see the progress. Everything is about ready. I dropped the head off this morning to have it checked. Now comes the fun part of putting it together without scratching the new paint. Then the electrical and plumbing. Still waiting to hear back from Isspro on the performax data logger system.